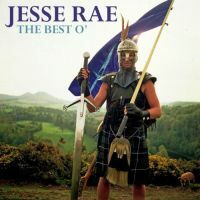 _Weel ah wanted tae tell ye a’ aboot a braw noo compilation o’ stuff frae the legend that is Jesse Rae. Well, I might not speak in RP English, but one sentence is my limit as regards trying to write in dialect. I’ll leave that to Jesse who manages to add his unique style to the CD liner notes which give a great insight into development of the tracks included. Jesse is a genius who has often been well ahead of his time. His biggest chart success is undoubtedly the Odyssey version of his song ‘Inside Out’ in 1982. Equally famous for his choice of kilt and steel helmet as everyday wear he strikes an impressive figure both in videos and real life. His 1996 album ‘Compression’ was visionary and innovative as it used cutting edge ISDN technology to enable him to record by playing along with other musicians who were situated in London, New York and South Africa whilst he remained at home in Scotland. A deep-seated love of rugby also saw him working on various projects including a song/video proposal as the theme for the Scotland team for the inaugural 1987 Rugby World Cup, and a restricted broadcast FM radio service on international match days at Murrayfield. He has done further work with Scottish schools to help them gain a range of experiences through using restricted broadcast FM radio. Recently he stood as a prospective independent candidate for the Scottish Parliament, and has also supported Adam Ant on tour. I have a strong feeling that Jesse might have enjoyed more commercial success if he had been less keen to stick to his principles; having said that I believe that this has probably been the reason for his uniqueness. Having been attracted by the lure of funk music he spent time in the USA working with many great musicians. His choice of dress sadly led to some seeing him as a ‘novelty act’. Writing about Jesse’s return to Scotland in 1983 this is described in Brian Hogg’s excellent book, ‘The History of Scottish Rock and Pop’. ‘The Best O’ album opens with ‘Over The Sea’ a loving tribute to his future wife, the ‘bonnie lassie beating her drum’, who also features in the accompanying promotional video. ‘Brave Heart’ is Jesse’s homage to Scotland’s national hero William Wallace. I highly recommend this welcome opportunity to get a great selection of Jesse’s work in one neat little package. His obvious love of Scotland’s heritage and powerful funk music is unique and a joy to experience. The quality of some of the videos available on YouTube does leave a bit to be desired but they do provide a great opportunity to experience the total audio-visual package that he produced.